I enjoy the lightness of the Scooby stories; two in each issue, without much depth. In this issue’s first story, “Safar, So Goodi,” the African veldt is haunted by a spirit of the land that claims to be protecting the animals. In truth, there is a more nefarious agenda afoot. But thankfully, Mystery Inc. is on hand to investigate. The second story is entitled, “The Weeping Bride of Lover’s Leap,” and capitalizes on the urban myth concept. A broken-hearted bride haunts the cliffside attraction where she supposedly died years ago. Facts are lost to legend, and all that remains are vague memories passed from one generation to the next. But to lure the bride from hiding, the team needs bait, and Shaggy and Scooby are it. Somehow, the idea of putting a dog in a dress seems foolish when Velma or Daphne could more easily fill the role. But hey, the dog talks, so check your sense of reality at the door. The series is a fun and light, much in tune with the original cartoon. 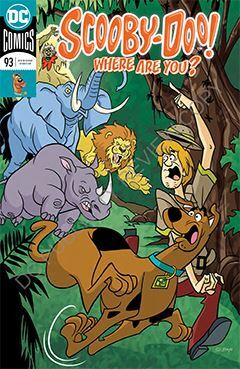 I never really regarded myself as much of a Scooby fan, but given how many ‘70s Saturday morning cartoons revolved around crime-solving kids, I shouldn’t be surprised I enjoy this title as much as I do.